Prized appetizers at the top; assorted goodies on the bottom. Perfect! Two tiers make an eye-catching presentation and save table space, while the rustic pine trays and steel wine barrel hoop add vintage charm. Trays spin together. Take serving to another level. Prized appetizers at the top; assorted goodies on the bottom. Perfect! Two tiers make an eye-catching presentation and save table space, while the rustic pine trays and steel wine barrel hoop add vintage charm. Trays spin together. Personalize top tray up to 20 characters each (including spaces) on two lines. This item ships directly from the manufacturer. Please allow 3-4 weeks for delivery. Select items will have additional shipping charges, please see above for this item's additional shipping charge. Can wine bottles be set on the bottom tier so that you could do glasses or napkins on top and bottles of wine on the bottom -- or is the height between the bottom level and the bottom of the top level too short to fit a standard wine bottle? wanting to buy quickly for a gift, please reply. BEST ANSWER: No, a standard wine bottle is 12". The space between the bottom and top shelf of the lazy susan is less 12" or less, so standard size wine bottles on the bottom part would not work.The total height of the piece is 13 1/4" high . can I custom order a smaller diameter for the bottom to fit my kitchen table like 15 inch bottom x 7 tall and top 15 inches? This works perfectly for our dining room table. It looks great and is extremely sturdy. This product is made out of pine and varnished to look like an aged wine barrel wood. They forgot to add the metal ring around the bottom tier. I called customer service and they had to send me anotehr one,.. Missed using this at my party. Hope the next one looks better. Gave this gift to my boyfriends mother and step father for Christmas they almost fell over they loved it. They are avid wine makers and collectors and it was the perfect addition to there wine cellar in progress and she said she would use it to entertain parties in the spring and summer. I would recommend this product the only downfall we had was that the product wreaked like stain still when it arrived (could be due to the Christmas rush) and it was overwhelming. Other than that a great gift/buy very beautiful piece. 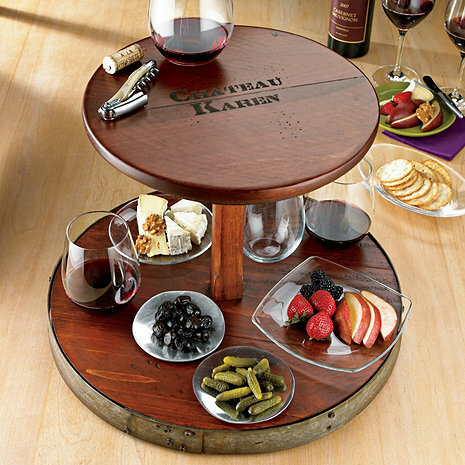 We'll use this for entertaining to display hors d' oeuvres. It will be a great conversation piece. However, I have to air it out in the garage until the pungent smell from the finish is less noticeable. it is both attractive and functional for our wine bar.